Nogaro : Maxime Jousse and Roar Lindland taste victory ! This new race at Nogaro, on September 27th and 28th, came to a successful conclusion for the Sébastien Loeb Racing. 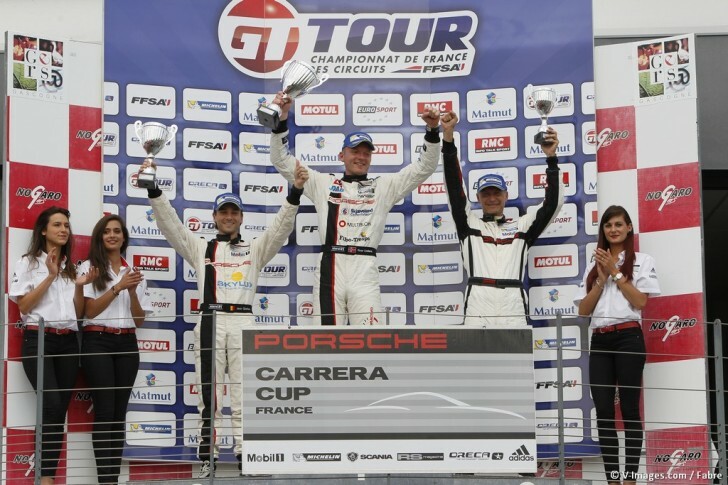 Once again in pole position of the Porsche Carrera Cup France, Maxime Jousse offered a new 2014 victory to the Alsace-based team, adding a second win to his personal prize list too. He did catch up with the leader during the weekend but unfortunately a penalty prevented him from scoring some precious points. Though the driver from le Var is now 26 points behind, just before the final race at the Paul Ricard, he remains determined to clinch a win at home and to fight for the title up until the very end. In the B-class, Christophe Lapierre had to say goodbye to a third consecutive title. Though he was in the lead, he came across an oil patch during the first kilometres of round one, and then was not able to defend his chances during round 2 because his car was too damaged. Sébastien Loeb and Dominique Heintz’s squad is still satisfied though, seeing Roar Lindland on the podium twice. On the third step to start with and then on the highest one. The Norwegian driver can celebrate his first win in France ! Roar Lindland, 3rd and 1st in the B-Class, Porsche 911 GT3 No.11 (Sébastien Loeb Racing) : « We have been happy, we have been frustrated, but finally we did it. And this time we get both the points and the trophy ! We are an amazing team and we’re now over the bad luck we’ve encountered at the beginning of the season, when our pace and efforts weren’t paying. Magny-Cours was very good and this weekend too since we took two podiums. It’s really good to gain some positions in the championship, even if it was a tough meeting. For the third time this season, Maxime Jousse was in pole position. With Joffrey de Narda alongside him, the first row was Sébastien Loeb Racing only ! As for Sacha Bottemanne, he was on the fourth row, in front of Christophe Lapierre who was amongst the Top 10, half a second only behind Jousse, and in pole position as part of the B-class. Roar Lindland occupied the fifth row of that category. Max and Joffrey had no hesitation when the starting lights went off, and both embarked on a 25-minute incredible sprint. Jousse stayed at the lead in front of his teammate, but the first lap was a rough one. Because of some oil on the track, Bottemanne made a mistake. The safety car went out at the end of the second lap when Christophe Lapierre got caught out by the same thing. Seven minutes later, when the race started again, Max Jousse launched himself in front of everybody else, racing at a high pace and widening the gap with Joffrey de Narda who was not taking that for granted. That duet managed to escape from the rest of the pack and crossed the finish line in that order, only two seconds apart and ten seconds before the third contestant. With this season’s second win added to the 10th place of his direct opponent, Maxime closed down the gap in the championship and comes back 7 points away from the leader at the end of this first race. Nicolas Marroc was great at catching back up with the others, going four places up in the rankings and crossing the finish line in 8th position. Finally, Roar Lindland showed all the progress he has been making throughout the past couple of weeks, achieving a new podium and climbing on the third step as part of the B-class, thanks to a great overtaking during the 7th lap. The quest to the title is on again and the 35-minute race had to allow Maxime Jousse to move upward from his 4th row, just behind Nicolas Marroc who had raised up his driving. Joffrey de Narda, Roar Lindland and Sacha Bottemanne occupied, in that order, the 7th, 8th and 9th row on the grid. Unfortunately Christophe Lapierre was not there, due to some irreparable damage on his Porsche, following on an incident that had happened the day before. At the start, Maxime overtook Nicolas and that duet kept on putting pressure on the 5th contestant during ten laps. At that 10th lap, Jousse hit Beltoise and went back down to the 11th position, while Marroc inherited the 5th place. De Narda was on the 10th rank at that point and Bottemanne, with a car that had become more competitive again, was 12th. During the 14th lap, Joffrey made a mistake which made him go back to the 13th position. Jousse and Bottemanne thus gained one place and were about to gain another one during the 21st lap once finally managing to overtake the dense traffic in front of them. Under the chequered flag Marroc was hanging onto the fifth position strongly, while Jousse, Bottemanne and de Narda ended up 9th, 10th and 11th. However, Maxime was given a 30-second penalty after having crossed the finish line and was finally ranked 15th. Roar Lindland came first in the B-class. A win that he sealed with a 20-second gap with the leader of the category !